There’s nothing like a visit to the County Health Travel Nurse to make you feel paranoid about traveling. At home you are looking at colorful guidebooks featuring photos of azure skies, palm trees and white sand beaches. At the nurse, she pulls out brochures with photos of mosquitoes and tells you about dengue fever. It’s like the nursing version of mommyblogging – one minute you think you are doing a good job as a parent, and the next you read something that makes you consider getting a CamelBak full of hand sanitizer. Apparently the only place to get typhoid shots in this county is at Public Health. I had to get typhoid shots because I’m going to Costa Rica. Did I mention that I’m going to Costa Rica? I’m going to Costa Rica. NOT on a mission trip. Not for anything worthwhile. Just for the hell of it. My BFF CC and I decided to go. She has a month off work, thanks to a budget-cutting government policy of giving her a couple unpaid days a month. She saved them all up. So now the kind citizens won’t have anyone to process their paperwork for a month, because she will be strolling the cobblestone streets of San Jose. Hey, taxpayers, if you want service, you have to PAY for it. Otherwise, adios, amigos. Que le vaya bien. I’m not going for a month, just 10 days. But I’m GOING! The original plan was to go to Buenos Aires, but I wasn’t feeling it. Then we talked about every other Spanish-speaking country on earth (one of our vacay requirements was that we get to practice our Spanish). Peru? Too altitudey. Spain? Too expensive. Venezuela? Too Hugo Chavez-y. Mexico? The drug cartel situation. I lobbied hard for Cartagena, Colombia, but got shot down. So. Costa Rica. We’re going to the Caribbean side, which the nurse told me is infested with malarial mosquitoes and typhoid, as well as some great beaches. I’m not worried. Oh, ho, not ME. I never worry about anything. Poison snakes, too. I’m sure it will be fine. I should shut up and quit whining. I’m really excited. 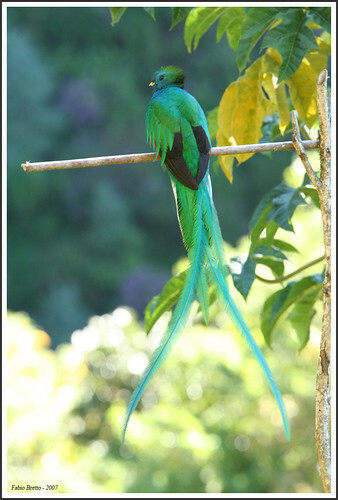 Not about dengue fever, but maybe I’ll see a quetzal. Photo by Fabio Bretto. Used under a creative commons license. I went to Costa Rica on my honeymoon and it was FANTASTIC. I do believe we saw some blue butterflies. We actually went to the west coast, and no one needed a typhoid shot. You will have a wonderful time. There are a lot of really amazing things in that country. I think the travel nurse errs on the side of caution. And I can’t wait to see blue butterflies! Hope you have so much fun! I stopped there once on a cruise, just for a day, but I loved it. Everyone I know who has been loved it there. My son went to Ecuador last summer. He had the oral typhoid vaccine. Two doses, but it lasts 5 years instead of 2. He had all his shots at Sansum clinic in Santa Barbara. Hm. I got the shot and am good with that. And am tolerating the malaria pills, so that’s good! Sounds wonderful! Cannot wait for the pictures. And I second the oral vaccine. Already got the shots. Owie! oh! You are going to have SO much fun! I hope so. CC was supposed to make reservations and has basically trashed the itinerary and switched things all around. I’m trying not to panic. It was only a few years ago that you could get into Costa Rica with just your driver’s license. I used to send students down there on volunteer programs. Never had any issues. Then again I went to Germany and got chicken pox and ended up in the hospital for 6 days. You just never know. You just have to go with the flow. Going with the flow is so not in my nature, Chris. Wow, that is going to be amazing! You will have a wonderful time. I am getting more and more happy about it as the warnings from the travel nurse wear off in my mind.